This community is for those who enjoy traditional "hoedown" square, round & line dancing (more of the one night stand, non-dance club type of dances). Its purpose is to facilitate interaction for dancers with similar interests. All interested dancers and dance leaders are welcome to join, share information and make each other aware of dancing opportunities. You may join the Square, Round and Line Dancing in Ohio group on Facebook. We will post a monthly blog listing dances in Ohio. Please email John Wargowsky about dances in your community to be included in this monthly listing. 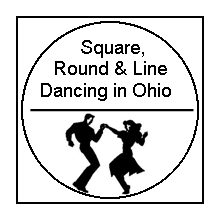 View our links about square, round and line dances in Ohio as well as useful resources. Become a member at no charge to fully participate in this community by receiving occasional emails about square, round and line dancing opportunities in Ohio.